Tuckshop Gardener: Pale, but otherwise unharmed, prisoners emerge from the cellar. Pale, but otherwise unharmed, prisoners emerge from the cellar. Even the gas man is giving me funny looks now. He knocked on the door to do a meter reading this week, and was ushered down into the darkness of the cellar, with me on his heels carrying a watering can. He looked rather nervous at the prospect. …they're ready for market on Saturday. Now I'm wishing I'd planted more up. These will be white 'Ard Shenk' crocuses in the coming weeks. Rather pretty, don't you think? Thanks Pam. I could do with more customers like you! 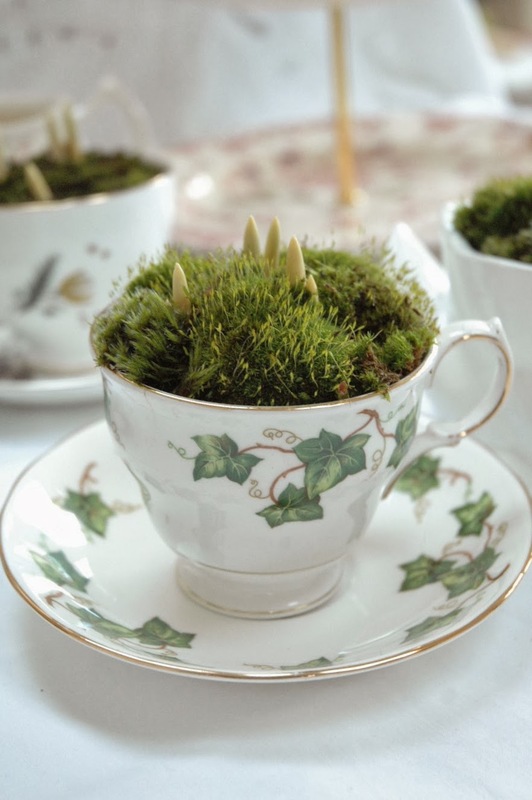 Lovely the crocusses in the teacups. When I could be there I should buy Ard Schenk. I think they'll be great when they are in flower - almost hope I have one left so that I get to see it. These are so pretty. How do you manage with watering them with no drainage? Ah, but that's the secret. I've drilled holes in the bottom to turn them into planters to address that precise problem! And grit in the bottoms. 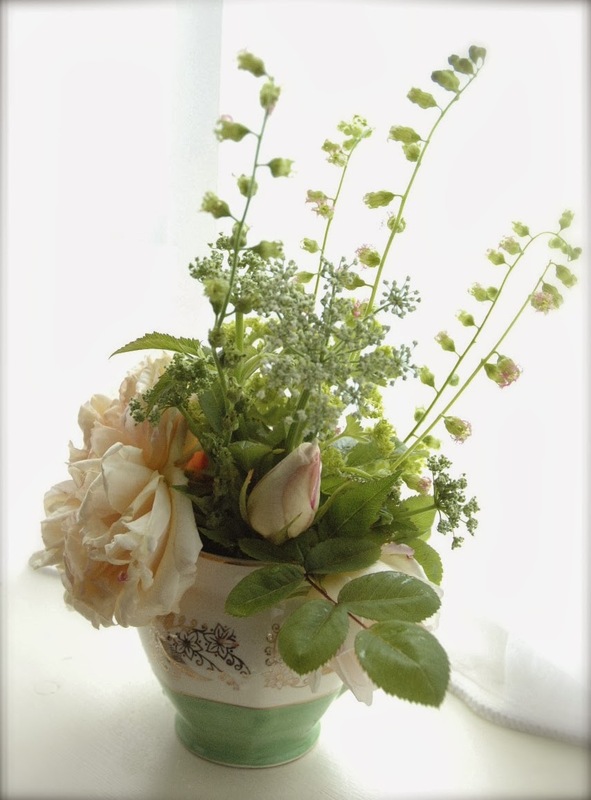 Want teacup planters? Look no further than my Etsy shop, Tuckshop China! 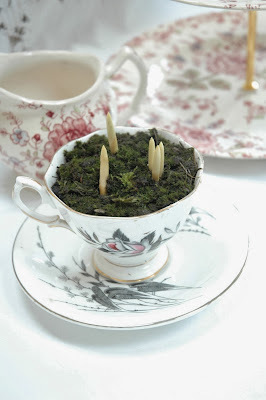 Or, if you are in the UK, you can buy a ready made crocus teacup from my website www.tuckshopflowers.com. While stocks last at any rate.....! Goodness, my comment showed up. Thought it had got lost or would post anonymously. Will take a look at the website. Not everything gets lost in the ether you see! Comments always welcome. I planted them in two batches - first ones on 10th October, and second lot 10 days later. Have just removed the second lot from the cellar as well and there is barely any difference in the growth with the earlier ones - it's just that having been in the light for a week, the first lot have started to green up a bit. I'm rather hoping that they will flower in time for Christmas, but as this is the first time I've done them, I'll have to keep you posted on that one. I've read that they take about 12 weeks, so will have to wait and see. No sign of snowdrops in my garden, but maybe I should go and shift all the leaves and look more closely - after my Christmas stalls have been and gone maybe…. as for watering, I keep them slightly damp rather than letting them dry out completely - but they need only minimal watering while they are in the cold dark cellar. The ones in terracotta pots need a bit more regular attention though as they dry out more quickly.